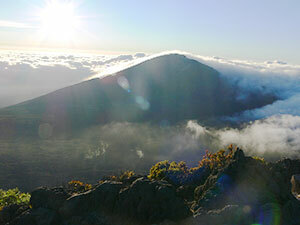 The United States Congress designated the Haleakala Wilderness (map) in 1976 and it now has a total of 24,719 acres. All of this wilderness is located in Hawaii and is managed by the National Park Service. The mother of the demigod Maui lodged a complaint with her son: the day was too short to dry her bark cloth. So Maui went to the great mountain and snared the sun's rays and held them fast with ropes. "Give me my life," pleaded the sun. "If you promise to crawl more slowly across the sky," said Maui. And the sun still hangs long in the sky over the island of Maui, whose great mountain is called Haleakala, "the House of the Sun." Two centuries have passed since the last lava ran from Haleakala Crater. Though dormant, the volcano is not considered extinct and, while no volcanic activity is evident today on Maui, Haleakala may erupt again. The national park that shares its name stretches from 10,023-foot Mount Haleakala north and far eastward to the cascading streams and quiet pools in Kipahulu Valley, which opens onto the sea. Within its borders you'll discover cool lava rocks, cinder cones as high as 600 feet, striking silver plants that bloom only once in their lifetime, and other rare species that grow only in this fragile ecosystem. No roads or trails connect the Haleakala Crater area to Kipahulu Valley, but both are accessible by paved roads from Kahului. Across the Wilderness of Haleakala Crater, 36 miles of trails access a land of stark contrasts and sudden weather changes; fog, rain, and chilly breezes are common hiking companions. Weather at high-elevations can be highly unpredictable and changes often. Cool temperatures, intense solar radiation, and rapidly moving clouds are characteristic. On overage, the temperature drops about three degrees for every 1,000 foot rise in elevation and often ranges from 50-65 degrees at higher elevations. These temperature can also feel much colder due to wind chill and damp, overcast conditions. Lower elevation areas closer to the coast receive daytime temperatures of 70-80 degrees and nighttime temperatures of 65-75 degrees. These areas average about 187 inches of rainfall per year. Planning to Visit the Haleakala Wilderness? How to follow the seven standard Leave No Trace principles differs in different parts of the country (desert vs. Rocky Mountains). Click on any of the principles listed below to learn more about how they apply in the Haleakala Wilderness.